Melania Trump helped her husband celebrate Black History Month Tuesday. 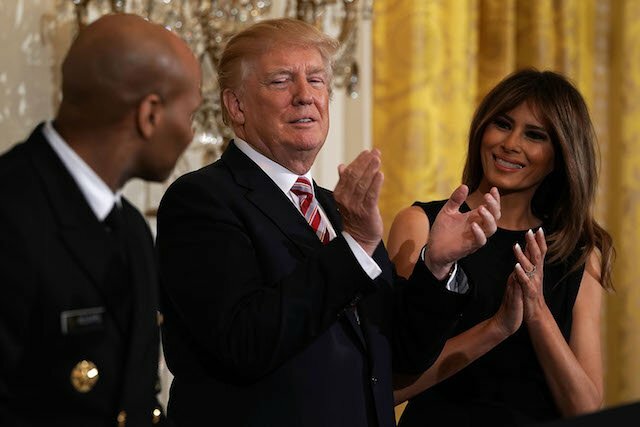 “It was wonderful to welcome guests to the @WhiteHouse this evening in celebration of National African American History Month,” the first lady tweeted after she and President Donald Trump welcomed leaders of the African American community to the White House for a reception. “We look forward to hosting many more events that celebrate our unique and diverse cultures. #BlackHistoryMonth2018,” she added. The president gave an inspiring speech at the event, recognizing the accomplishments of Frederick Douglas, Harriet Tubman, Rosa Parks and Dr. Martin Luther King Jr.
“Today marks the start of #BlackHistoryMonth Let this be a time to come together in a celebration of diversity,” the first lady captioned her post on Instagram earlier this month.